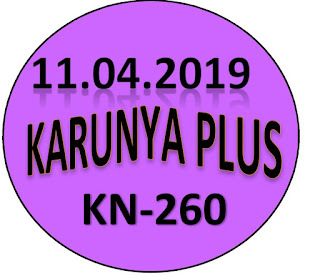 Kerala lottery guessing / predictions for KARUNYA PLUS KN-260 dated 11.04.2019 is published below.These guessing number are just our and our visitors predictions. This is only a speculative game for fun and to increase the curiosity on the draw. 4/10/2019 19:42:13 Murugavel Selam 166, 612, 323, 010, 516, 816, 129, 204, abc 51 , 61 , 41 , bc. 4/11/2019 12:47:57 Jayakumar Chennai All board. 478. 214 " 412 " 421 " 241 " 142 " 497 " 479 " 472 "
B = 3 - 9. 029, 023, 020, 099, 093, 090, 089, 083, 080, 629, 623, 620, 699, 693, 690, 689, 683, 680. 182, 187, 192, 197, 882, 887, 892, 897.